This image shows the Christopher H. Rynierson family. 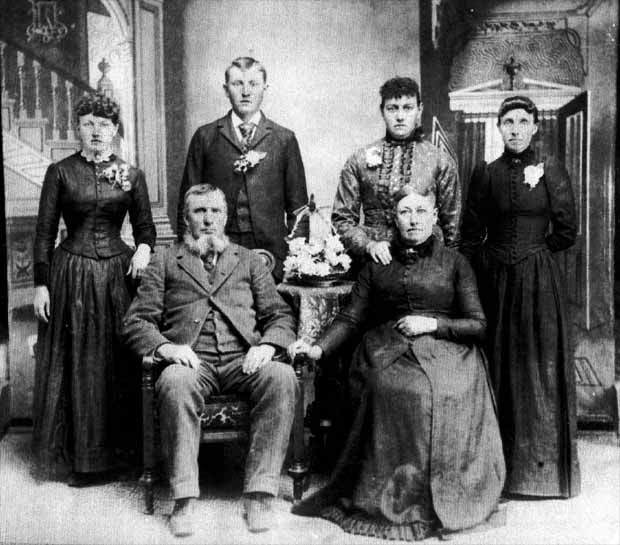 Seated (L-R): Christopher and his wife Mary Elizabeth Pipes Rynierson. Standing (L-R): Maggie Rynierson Dawson; Benjamin Rynierson; Nancy Catherine Rynierson Abbott; and Cynthia Rynierson Blair. An electronic copy of this image, and written permssion to post it on the 80th Indiana website, were provided courtesy of Corporal Rynierson's Great Granddaughter Sharon McClure Lamey. Christopher was a resident of Winslow in Pike County, Indiana when he enlisted on August 19, 1862 into what became Company H of the 80th Indiana. He was mustered into the Union Army at the rank of Corporal for a 3 year term of service in early September 1862 at Camp Gibson near Princeton, Indiana. He was mustered out of the Army on June 22, 1865 at Salisbury, North Carolina when the 80th was disbanded after the end of the war. All Rights Reserved. Created January 18, 2004. Last updated December 2, 2004.